Say what you will about the rabidness of Star Trek and Star Wars fans, Battlestar Galactica has fans like Gary King who build incredible six-foot-long, hyper-detailed models of obscure ships entirely out of LEGOs. 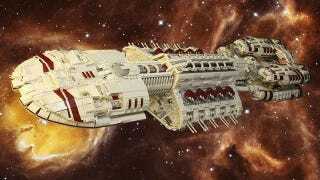 King spent two months on this mammoth build of the Battlestar Berzerk. The final model measures 73 inches long x 24 inches wide x 14 inches tall and weighs a staggering 54 pounds. It's so large that King had to employ a wooden inner backbone for stability and steel reinforcements for the lower engines that were simply too large to support their own weight.